If you are looking for ideas for a project, an excellent source is Lark Books’ 500 Series. 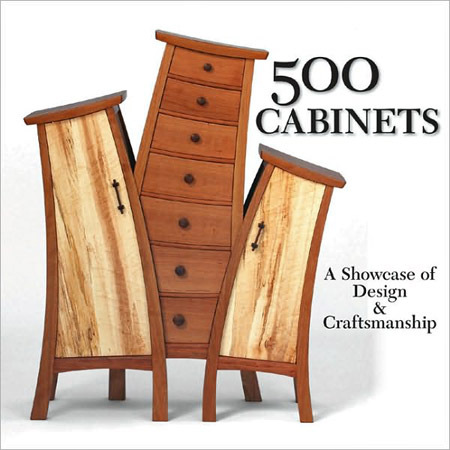 While this series covers many craft media, woodworkers will find the most inspiration from 500 Cabinets, 500 Tables, 500 Chairs, 400 Wood Boxes, and 500 Wood Bowls. Even if you are not looking for ideas, there is much in these books to appreciate and enjoy. You will probably do lots of nodding, plenty of eye widening, some jaw dropping, and, naturally, some wincing. The books, all stout 8″ x 8″ paperbacks, sell for about $12-14 on Amazon. Each book delivers a huge quantity of outstanding work. There are no artist’s statements or lengthy ruminations, just a quality photograph, occasionally two, of the piece, with the artist’s name, a title for the piece, and size, material, and finish information. I like to look at lots of sources, in print, online, and best of all, in person. Aside from the sheer pleasure of it, this activity expands my creative thinking as the imagery mixes and reacts with my own design chemistry. The eventual product is, hopefully, something meaningfully personal. When looking through these or similar collections, ideas come from all directions. A box may start a chain of thought for a cabinet, or a chair for a table, and so forth. To be clear, I am not advocating lifting designs, a form of theft, and purporting them to be yours. Yet, there is unlikely anything completely original since we all absorb what came before even as we make our own discoveries. By way of disclosure, my work is in one of these books, which gets me a single free copy, but this review is not compensated. I just like the books. I just bought 500 Cabinets & 500 Tables with a couple of Barnes & Noble coupons. I’m really looking forward to leafing through them. I bought this book months ago and enjoyed the read. I bought it for inspiration, and I was not disappointed. However, there are some wacky pieces in there that I would not have included.